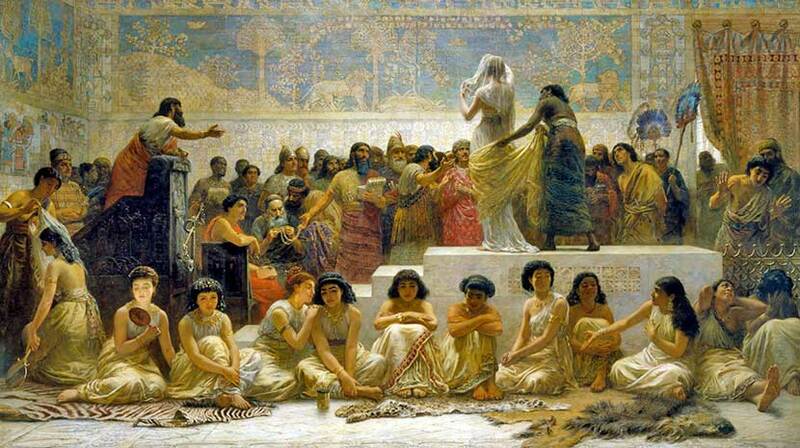 The Babylonian Marriage Market by Edwin Longsden Long, ca. 1875. This picture speaks a thousand words about the corruption of Babylon, whose name has become synonymous with licentiousness and cynicism. Sissal’s soft voice sounds so pretty here, singing The Prayer with Josh Groban. Dear Heavenly Father, I lower my head before you and confess that I have too often forgotten that I am yours. Sometimes I carry on my life as if there were no God, and I fall short of being a credible witness to You. For these things I ask your forgiveness. And I also ask for your strength. Give me a clear mind and an open heart so I may witness to You in my world. Remind me to be who You would have me to be regardless of what I am doing or who I am with. Hold me to You and build my relationship with You and with those You have brought into my life on earth. This is continued from yesterday’s Devotion, so you might want to look at it for background information. In the first dialogue, Habakkuk criticized God for allowing Jerusalem to live in wickedness; how could a just God allow the city of His Temple to be ruled by such idolatrous, immoral, greedy people? God responded by basically saying, the problem is being solved right this minute. He had raised up the Chaldeans (Babylonians), “dreaded and fearsome”, who would turn Jerusalem into rubble and take its people captive. We have put one of Habakkuk’s metaphorical passages in today's Scripture to demonstrate his remarkable style. His complaint to God compares “men” — meaning generally the people that the Chaldeans have been conquering, and specifically the Hebrews — to fish in the sea. The fish swim wherever they want, without a leader. Habukkak complains of a situation very much like the contemporary accepted standard of self-realization. His frame of reference is 180 degrees opposite the modern secular one, for he considers “everyone doing his own thing” to be a characteristic of lower life forms, “creeping things without a ruler over them”. The Chaldeans find these leaderless fish easy prey. They catch them with hooks and nets, and rejoice over the big easy catch. And having done so, they make their fishing net into a god and worship it! This rich metaphor has a wealth of applications. Think of anything that wicked men make into a god and serve, because it has given them power over people who are foolish and rudderless. Money. Television. A national flag. Cults. Political parties. The list is endless.